Meridian explains the basics and the details of this rule which limits the deductibility of compensation to certain employees. What is qualified performance-based compensation? Before payment, the compensation committee must certify that the performance goals were achieved. Stock options and SARs are performance-based if the requirements for outside director and shareholder approval are met. Restricted stock cannot qualify as performance-based compensation unless the grant or vesting is contingent upon the achievement of performance goals. Section 162(m) provides that no “publicly held corporation” will be allowed a deduction for “applicable compensation” paid to any “covered employee” if the amount of the compensation for the “taxable year” exceeds $1 million. Each of the highlighted concepts is discussed on the following page. Applicable compensation includes all compensation that would otherwise be deductible except for the following types of pay which receive specific exemptions from the deduction limit under Section 162(m). Payments to or from a tax-qualified retirement plan. Amounts excludable from gross income (e.g., miscellaneous fringe benefits and employer-provided health benefits) and pay deferrals. Covered employees are defined as the CEO (as of the close of the taxable year) and the three highest paid executive officers as reported in the proxy (the CFO is excluded from the definition of covered employee). An executive officer whose employment terminates during the year will not be covered by Section 162(m), and therefore termination payments such as severance payments will not be subject to the deduction limit. 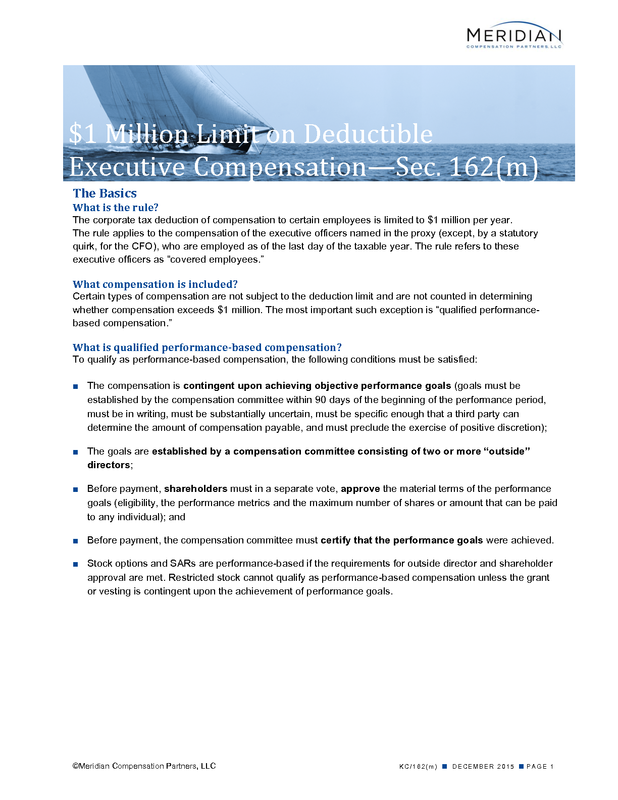 The most significant exemption from the deduction limit under Section 162(m) is “qualified performance-based compensation.” For compensation to be treated as qualified performance-based compensation, the following criteria must be met. Compensation must be based on written, pre-established performance goals approved by the compensation committee not later than 90 days after the commencement of the applicable performance period. However, a performance goal will not be considered pre-established if it is instituted after 25% of the performance period has elapsed. The goals must be objective. A goal will be considered objective if a third party having knowledge of the relevant facts could determine the amount to be paid. The goal must not allow for discretion to increase the amount of compensation payable. However, downward adjustments are permitted, even if discretionary. Attainment of the goal must be substantially uncertain at the time the goal is established. The plan and performance measures must be subject to shareholder approval. To comply with this requirement, the following disclosures must be made to shareholders: (i) the material terms of the plan; (ii) the maximum amount payable to any one participant (typically the number of shares which may be granted under stock options and SARs, and either a dollar amount or number of shares with respect to other types of awards); and (iii) a general description of the business criteria upon which the performance goals may be based (i.e., performance measures). Generally, companies disclose a fairly standard list of performance measures (such as return on equity, net income or earnings per share). Performance goals must be established by a compensation committee comprised solely of two or more “outside directors”. The definition of outside director differs from the NASDAQ and NYSE definitions of “independent” directors. Each year, companies should obtain an opinion from counsel that compensation committee members meet the definition of “outside director” under 162(m). Prior to payment, the compensation committee must certify that the goals were attained. Generally, the grant of stock options and stock appreciation rights that are approved by a compensation committee meeting the requirements of Section 162(m) will be treated as qualified performance-based compensation not subject to the deduction limit (assuming the underlying equity plan has been approved by shareholders and sets forth the maximum number of options/stock appreciation rights that may be granted to an individual during a given year).